I took this photo while on a train in Switzerland. We we going from Interlaken to Bern. Everywhere we looked was picture perfect. There are so many great scenes from this trip. I'll be posting more later. 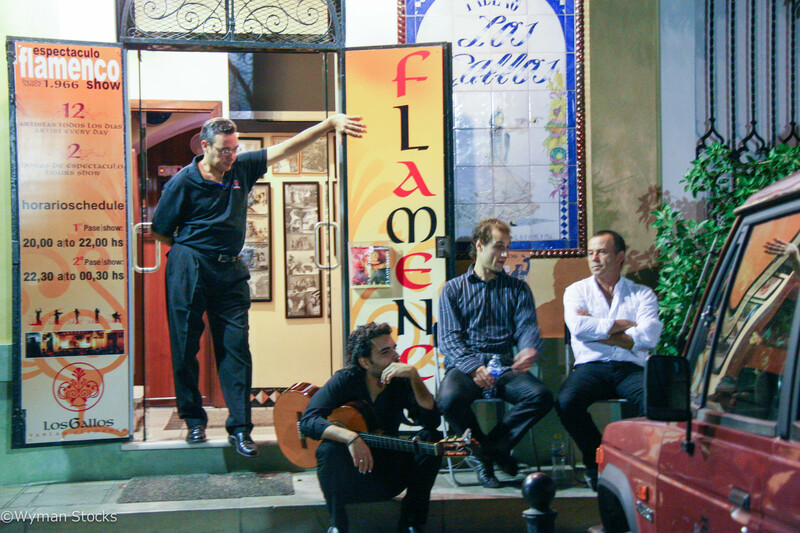 Pictured above is the front entrance to the Los Gallos flamenco venue in Seville, Spain. The three guys sitting down are performers in the show. There are two shows each evening. They were taking a break before the late show started. We have been to a couple of different ones in Seville. Los Gallos was our first and is still our favorite. Below I'll highlight what we felt made the difference between this and other venues in Seville. Service - The service is great. They come around to take drink orders before the show. You can also have a slight break in the middle of the show to take a bio break and/or order drinks again. Everyone on the staff is extremely down to earth and will talk to you including the performers (though they are obviously busy!). Seating - Los Gallos' seating is set up to minimize blind spots. So, no matter where you sit it is very likely you'll have a clear view of the stage. Some other venues have quite a few seats with obstructed views. There is also a balcony which is where they tend to sit families with any young-ish children. The balcony gives the kids just a little space to squirm around as they will do without disturbing the main seating area. Performance - The shows are two hours which is great. Other venues are similarly priced for only a one hour show. The performers are what really make the difference at Los Gallos. They seem much more passionate about their craft plus there are more performers per show than at other venues. The extra performers is probably owing to the two hour show length. This gives the show more variety and a great fiesta scene at the end. All in all, I can whole-heartedly recommend Los Gallos if you are in Seville (Sevilla) and want to watch a flamenco show. 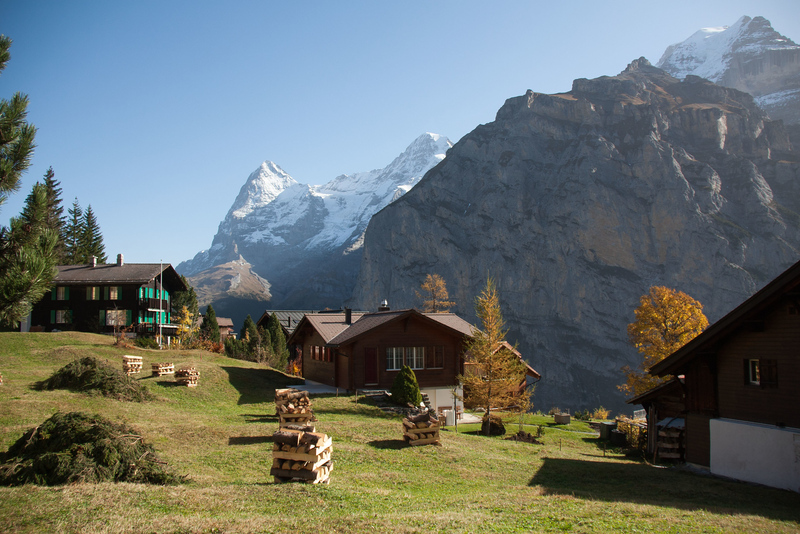 Here is a picture perfect scene from the village of Mürren in Switzerland. I recently spent a week there. You cannot get to Mürren by car. 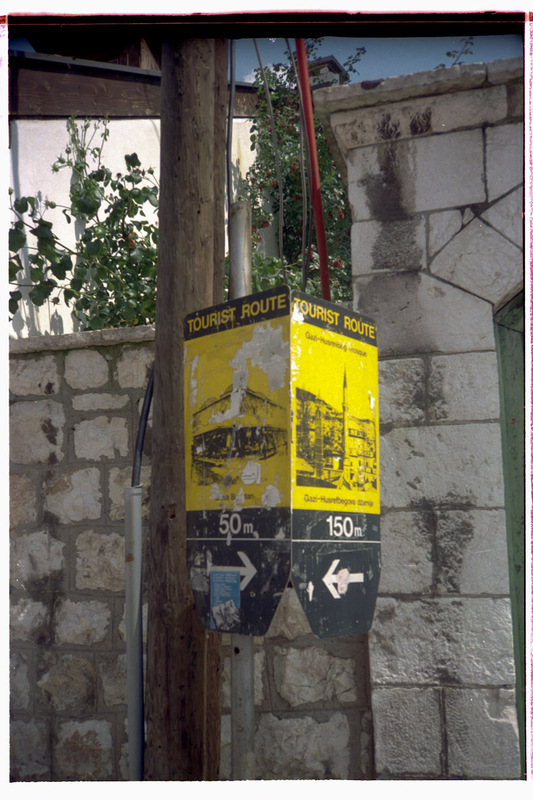 The only two ways to get there are train or cable car as it is 1650 meters (about 5000 feet) up in the Alps. The main sounds you hear are cow bells ringing as the cows graze all day in the hilly pastures. Check out a previous post of mine on Mürren to see a sample of activities in the area. Also, the evening sunsets can be magical to watch sometimes. You can buy a print of this image if you'd like to hang it on your wall at home or in the office. People often ask me, "How do you pack for a three week (or month) trip?". My answer is always the the same. Pack for one week and do laundry just like if you were at home. You can hand wash things in the sink. Quick dry clothes work well for this. But, there's nothing that beats the feeling of a freshly tumble-dried shirt when you've been on the road for two weeks. Most hostels have a washer and dryer. 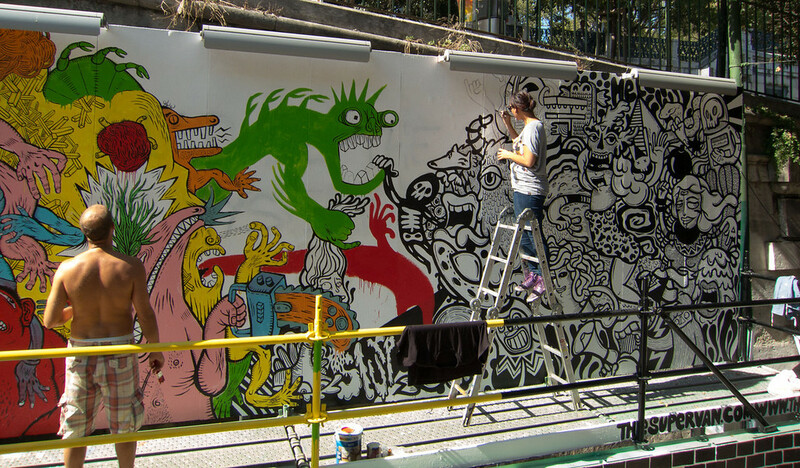 This is great other than maybe having to wait for other people to finish. If you are in a hotel though it is a different ball game. Hotels usually have a "laundry service" which means they'll do your laundry and charge you by the piece. 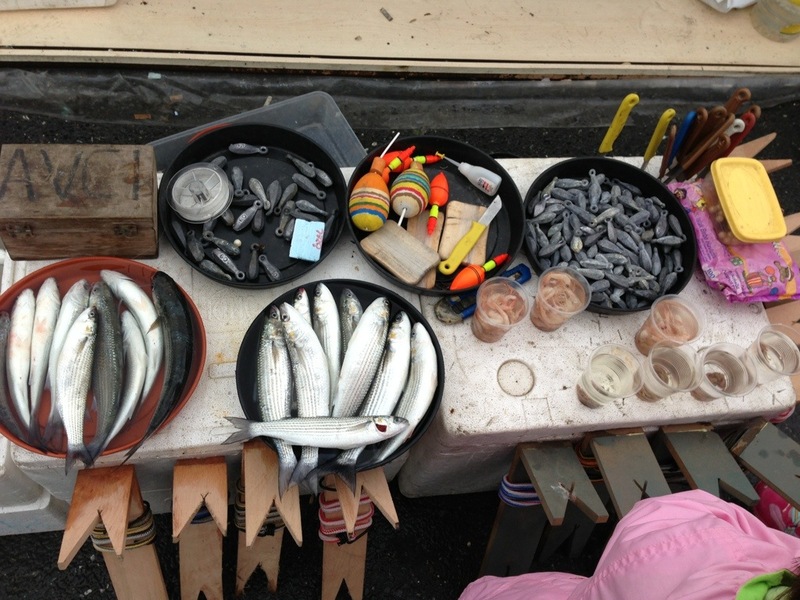 For example, maybe seven euros to wash a pair of pants, two euros for a pair of socks, etc. Just not worth it in most instances. The hotel front desk staff almost always knows where a local "self-service laundry" place is if you ask. They will first tell you about the hotel's laundry service, of course. But, they know it is expensive. 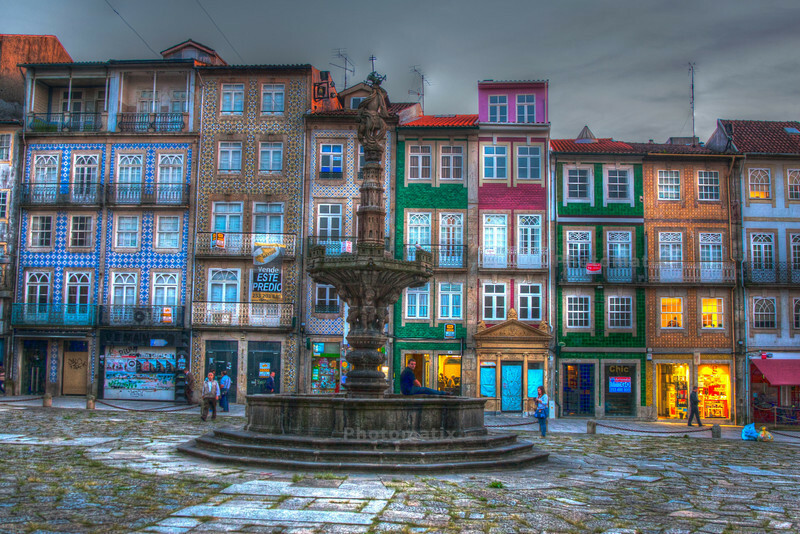 Only once has a hotel not known where a self-service laundry place was and that was in Porto, Portugal. Even then, the front desk guy got on Google and found us one about a mile away. The concept of self-service laundromats is just not popular in Portugal. But, they do have them. In general though, this is how the systems work at the self-service laundry places I've visited. Go to the pay station put some money in and press the number of the machine. If you get change back, bonus! For dryers: If it is a standard 10 minute cycle and you want 20 minutes just do the pay station piece twice before going to the next step. 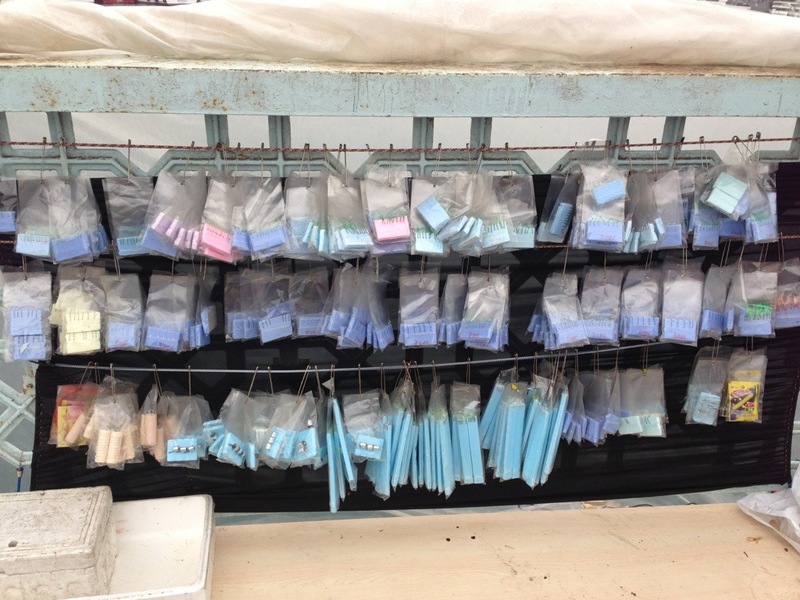 Dryers usually go in 10 or 15 minute increments. I've rarely had to use more than 20 minutes to get the clothes dry. Look around while you are waiting. A lot of times the laundry place will have baskets that you can use when swapping your clothes from the washer to the dryer or from the dryer to the folding table. I did not notice these at first. The baskets really come in handy so you don't drop socks and underwear on the floor. I will do a separate post to list some of the places I've had good luck with. As I find other places, I hope to update the post with new self-service laundry places along with any gotchas. 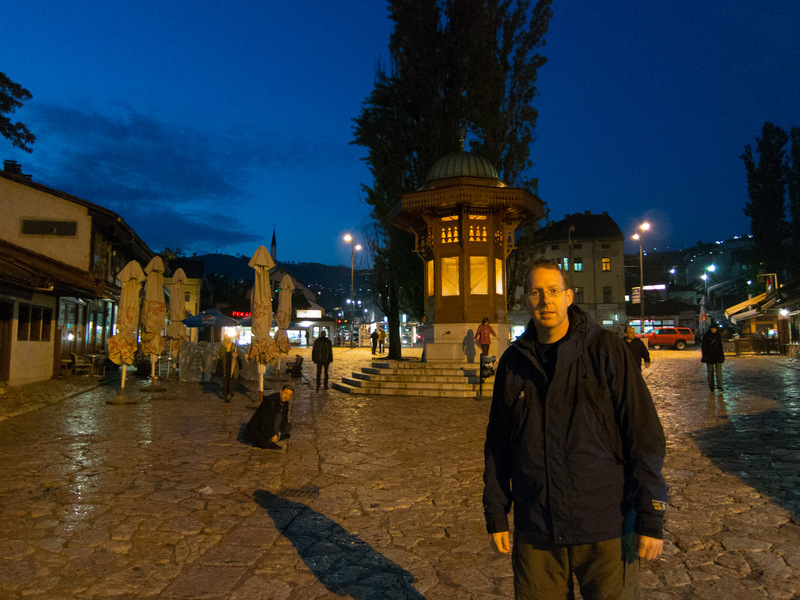 My first trip to Sarajevo was in August/September of 1995 and recently returned in May 2012. What a difference 17 years can make! The city is radically different now and at the same time a few things have not changed. 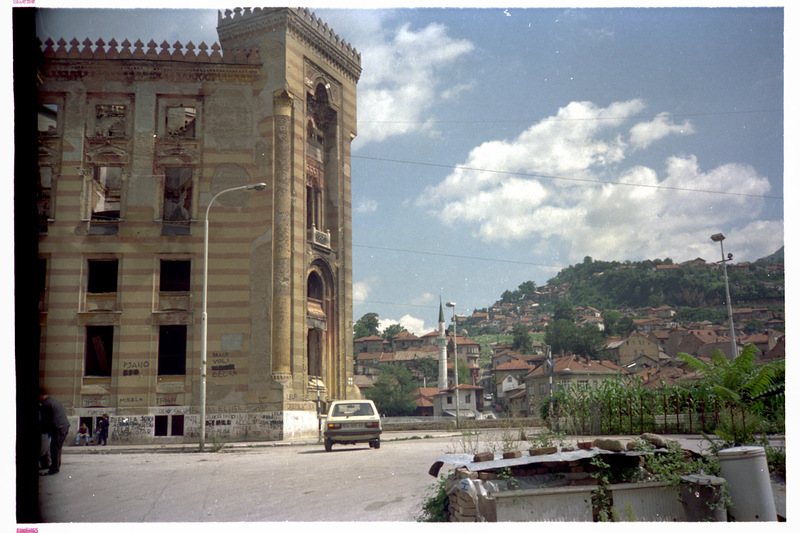 When I was there in 1995, the airport was shutdown and the every entry way into the city was controlled by the Serbian Army except for one route. I went in through a series of Serb checkpoints and left via the one route that was open. Saying it one route was open is probably not technically correct, but the only checkpoints on that route were staffed by the United Nations Protection Force. In 2012, the airport is open, trains and buses come and go freely, and we even drove a rental car in from Croatia. We even made a stop in Mostar on the way and found the Bosnian country side very beautiful! 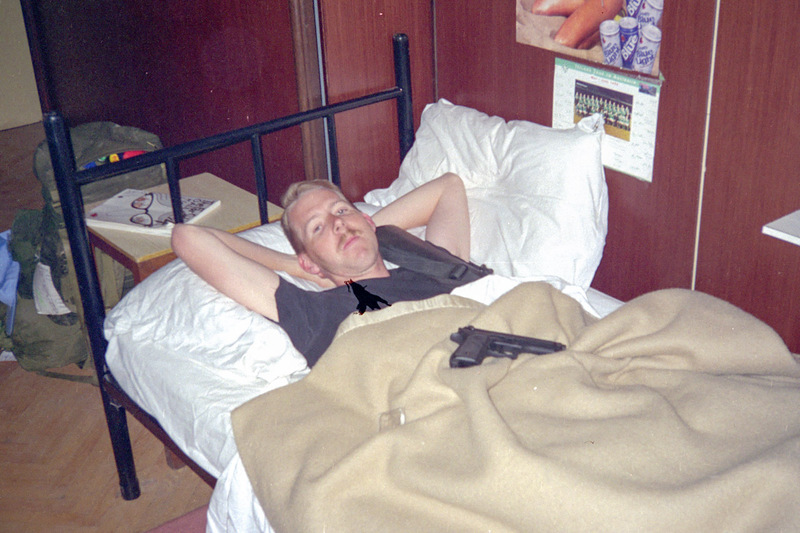 While I was in Sarajevo the first time, my bed really was someone else's. I used the bunk of a Canadian guy who'd gone home for some rest and relaxation. I never met him and do not know his name. Two or three other guys shared the room with me. We had a bathroom down the hall. The only trouble was showers were limited to two minutes. Yes, 120 seconds. Try that the next time you hop in to get clean. Contrast that image to staying at the City Boutique hotel that my wife, daughter, and I stayed this time. No comparison, obviously. I must say though, the hotel and especially the staff could not have been better. This is a highly recommended hotel if you ask me. Nothing like a nice spacious room and a long hot shower! 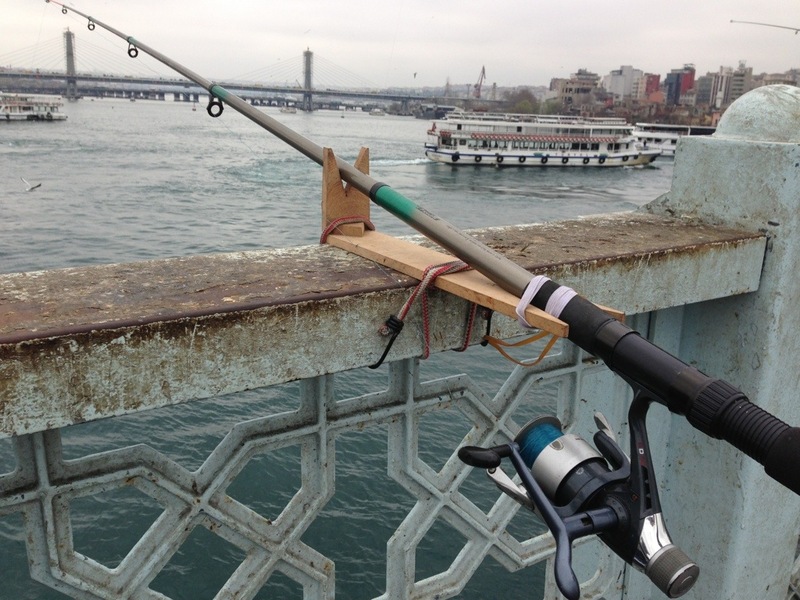 The two main things that stick out in my mind are near the Turkish Quarter Bascarsija square and the National Library. 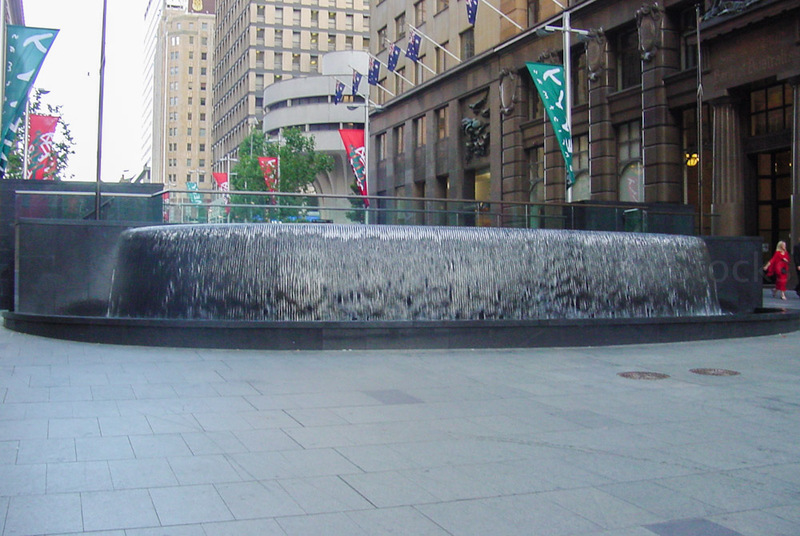 The square was deserted while I was there in 1995 even though it was still sign-posted as a tourist area. Bascarsija square had very few people in it in 1995. 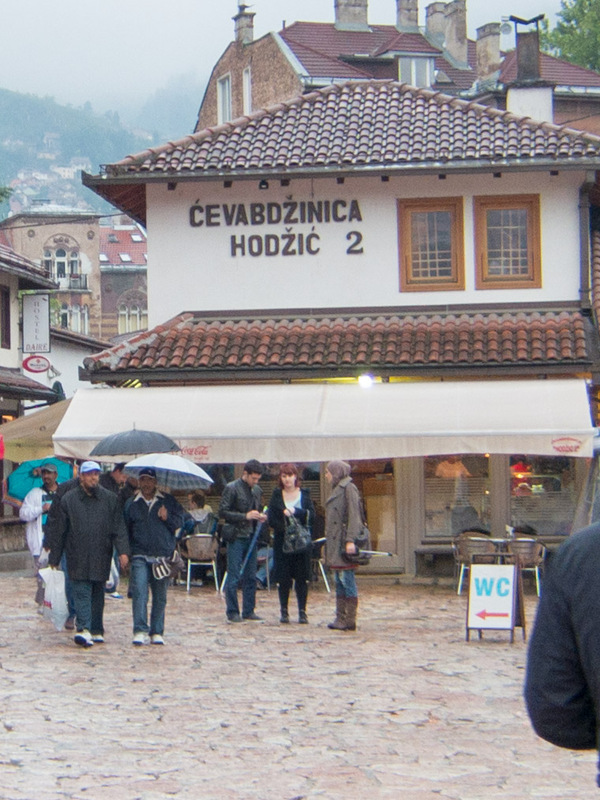 Today, in 2012, it is truly a bustling tourist district with a mix if Bosnians, Serbs, Croats, as well as international visitors. 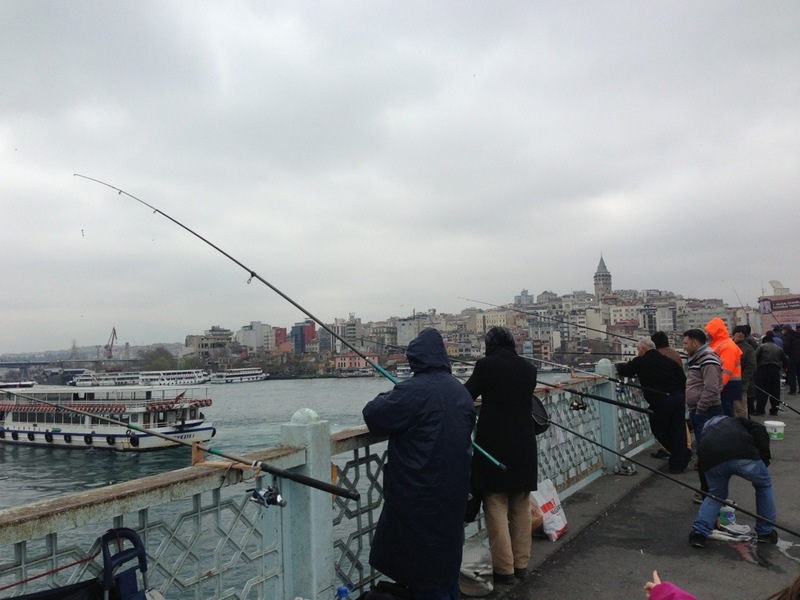 We met and chatted with some business men from Istanbul, Turkey one night. 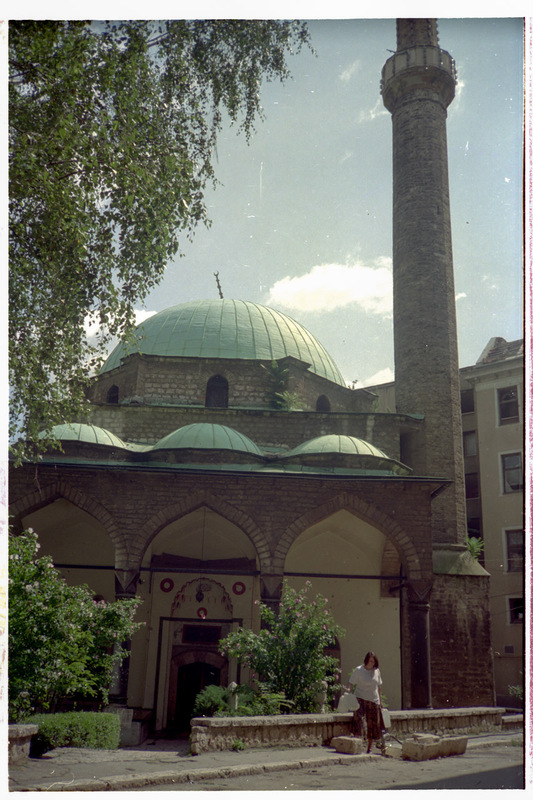 They were really nice, peaceful mean who told us that visiting to this area of Sarajevo was very important for Turkish people. 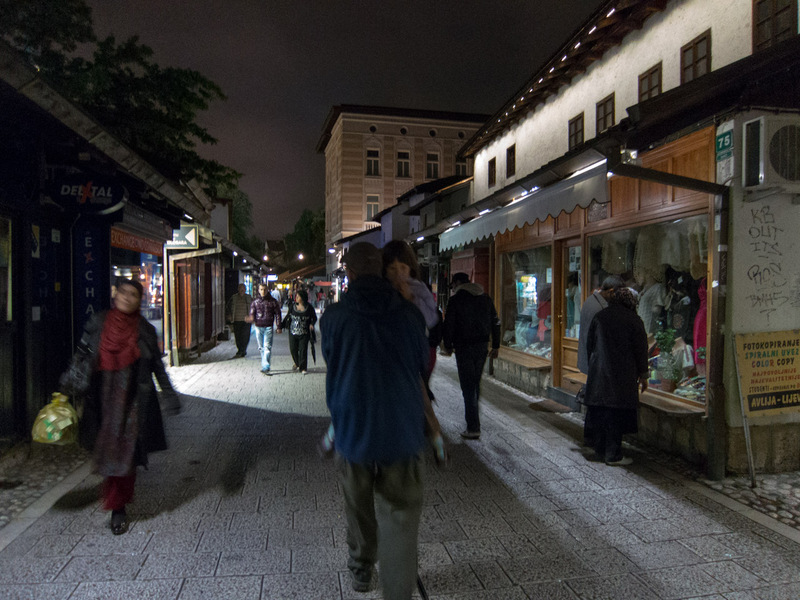 Contrast that with a night scene of the same street in 2012. If you look closely in the background you'll notice that same tall building on the right is in much better shape now. The whole area has a totally different vibe now. 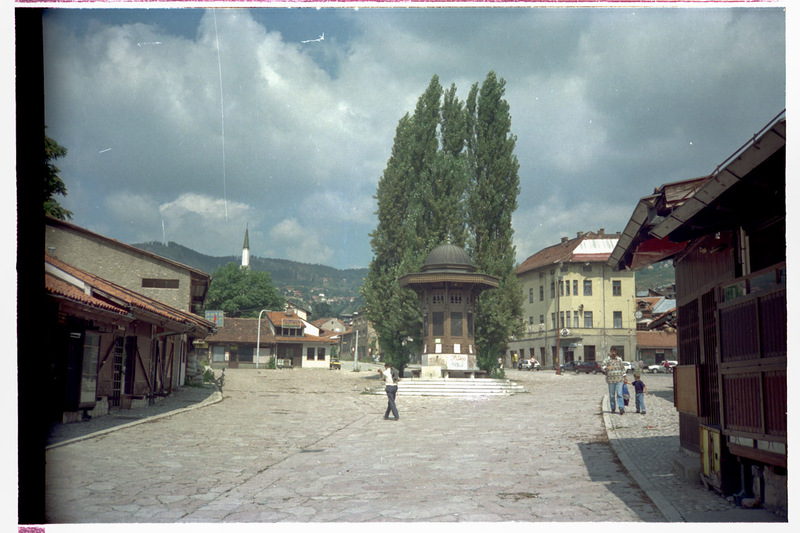 Here are then and now photos of the main tourist square itself. The activity around the area is also radically different now. Back then, people would walk fast and mostly get out for essentials. No one had a water supply at home. 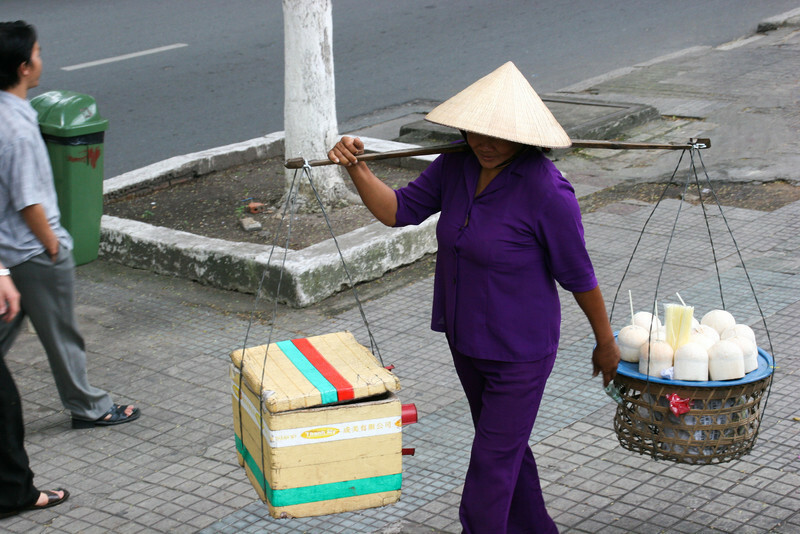 Notice how this lady is bringing water jugs to fill them at the local mosque. 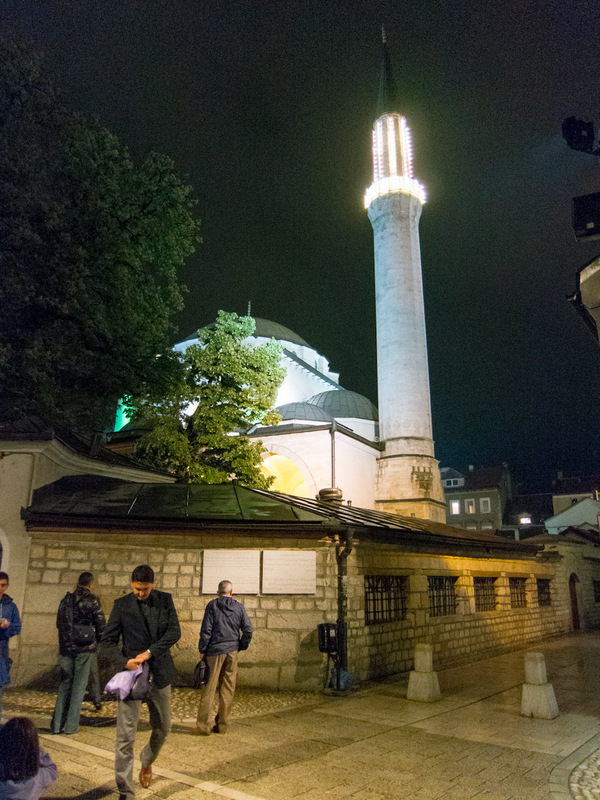 Today, in 2012, that same mosque area is full of people just walking and chatting and looking for the night's entertainment and food. Again, a much different vibe than 17 years ago. 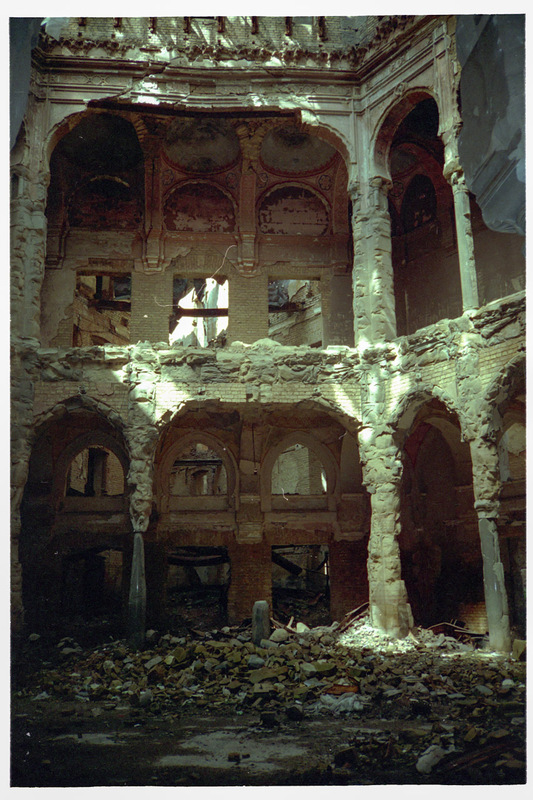 The National Library was all but destroyed during the war. Today, no one can go inside and the outside of the building is completely wrapped with a type of contruction cloth and scaffolding. There are workers inside would not let me inside to take any current photos and somehow I did not get a good photo of the outside either. Here is what the National Library looked like in 1995. Sad. Just sad. One thing that does not show in the photos is the beautiful marble floors that were covered with debris from the broken building. I was very much hoping this building had been restored. Maybe next trip. They are obviously working on it now. Outside of the building on the left of this photo. You can see the Windows are blown completely out. Here is what the inside looked like in 1995. Again, it was just sad to see that no progress has been made on restoring the National Library. Walking around inside this building has always been a vivid memory for me, even today. There were very few places to eat outside of the UN compounds when I was there in 1995. However, we did find one very nice sit down restaurant, Cevabdzinica Hodzic. There were sandbags in the windows to protect them from sniper fire and/or a mortar blast. The food was excellent though even back then. That restaurant is still open today and event expanded to a second location. They even have a Facebook page now. The food is so good we ate there twice this trip! 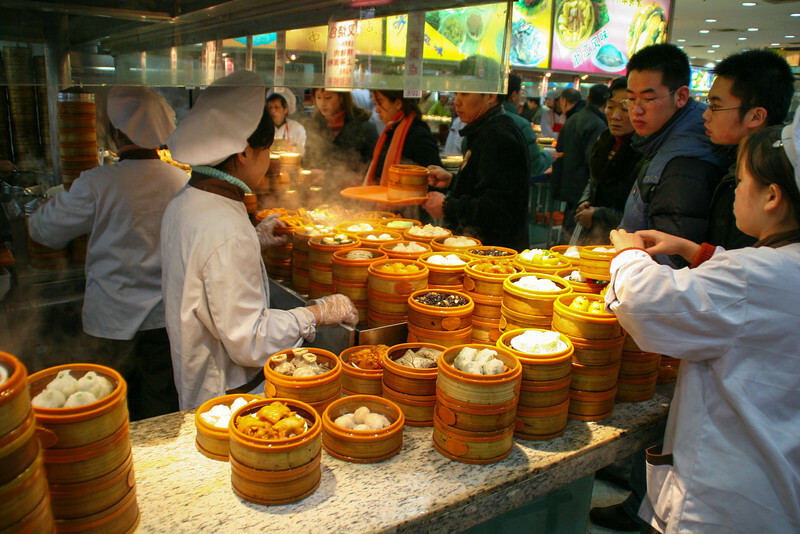 There are so many places to eat now it is hard to choose. Cevabdzinica Hodzic Restaurant then. 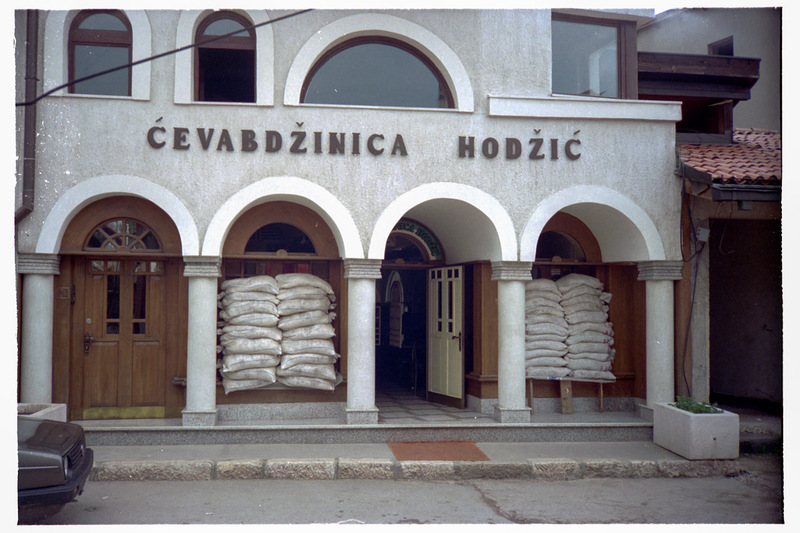 Cevabdzinica Hodzic Restaurant second location in 2012. For this, I'll go back a little further in time to give context. 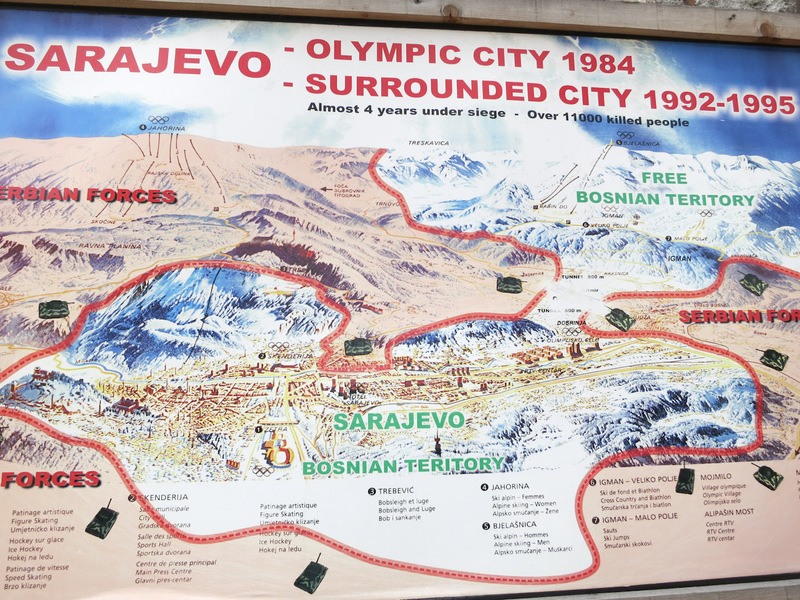 In 1984, Sarajevo hosted the Winter Olympics. Mt Igman was one of the primary places for the skiing events. Amazingly, a good bit of the Olympic history made it through the war with only minor, if any, damage. 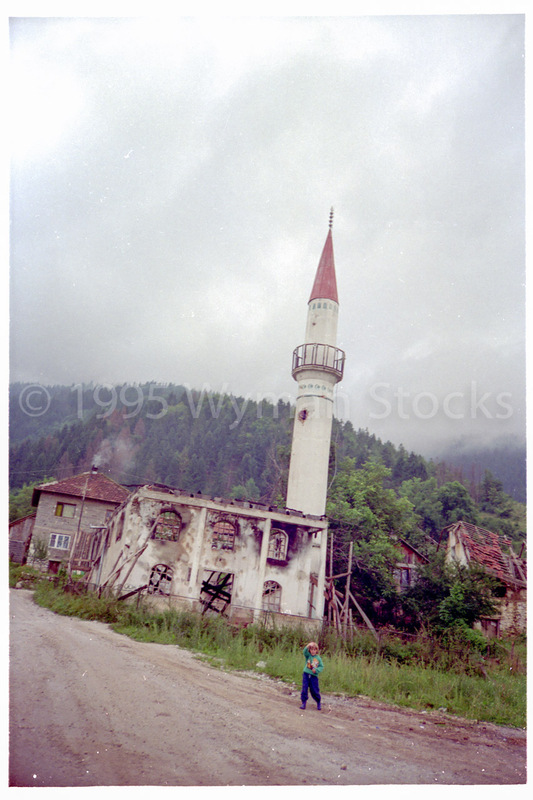 1995 - Mt Igman was the only way into or out of Sarajevo that was not controlled by the Serbian Army. 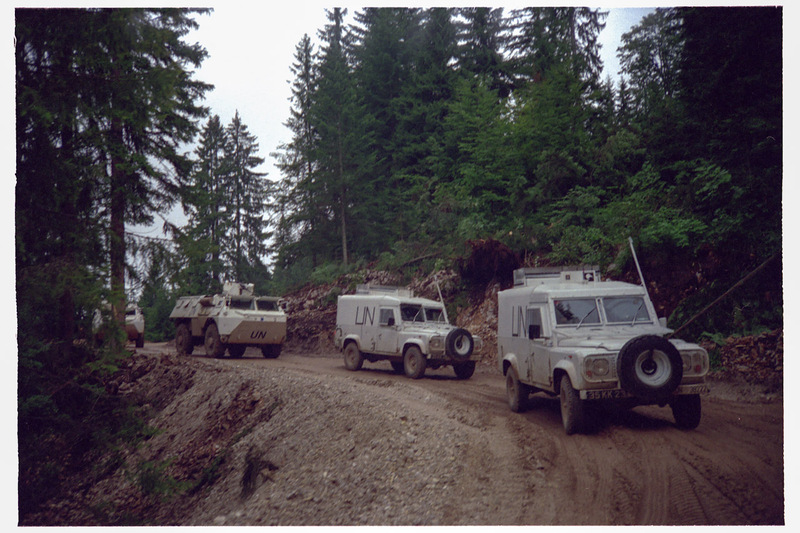 The roads were maintained by the United Nations Protection Forces. 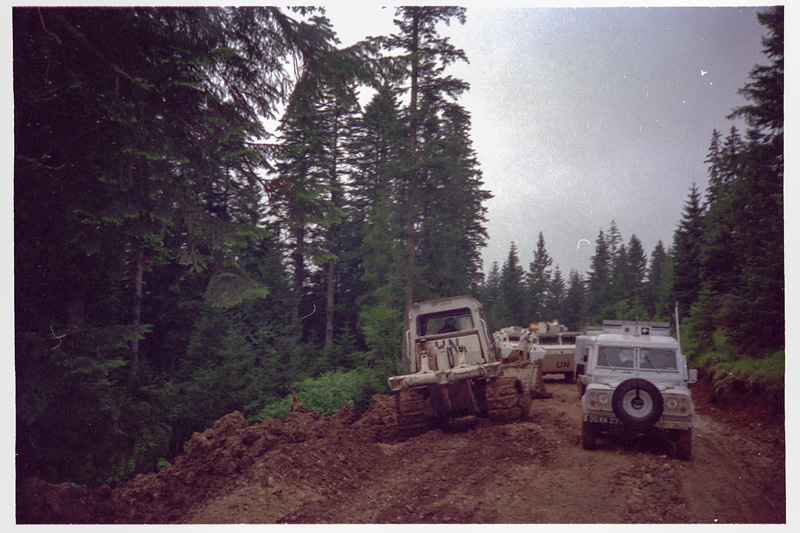 2012 - The "roads" over Mt Igman are in very bad shape. 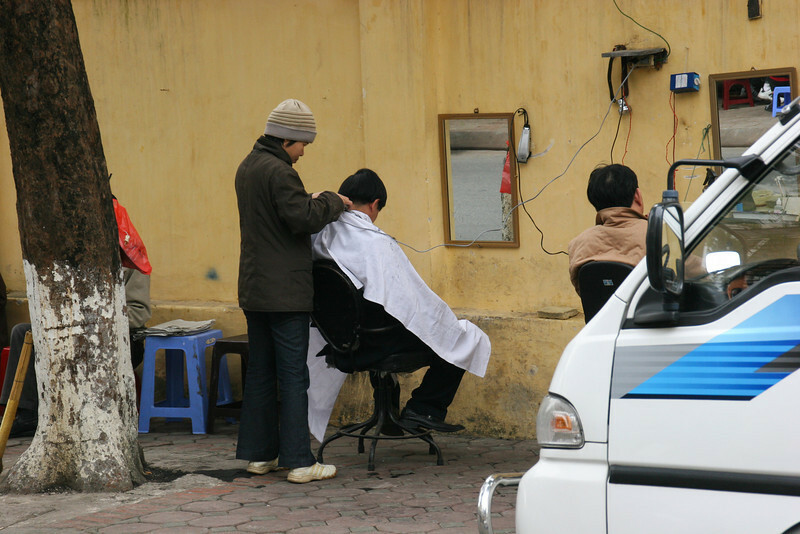 Today they are used mainly for recreational sports like motor bike riding. 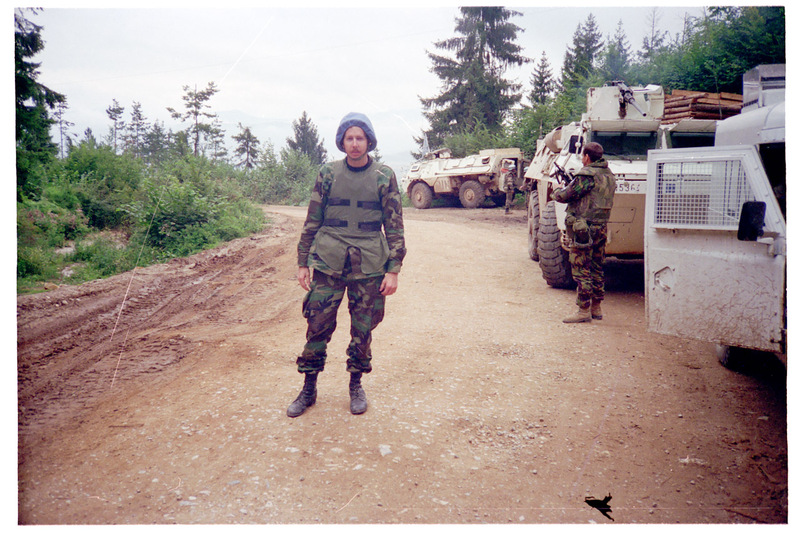 This is me waiting to clear a checkpoint on the way out of the city on Mt Igman in 1995. 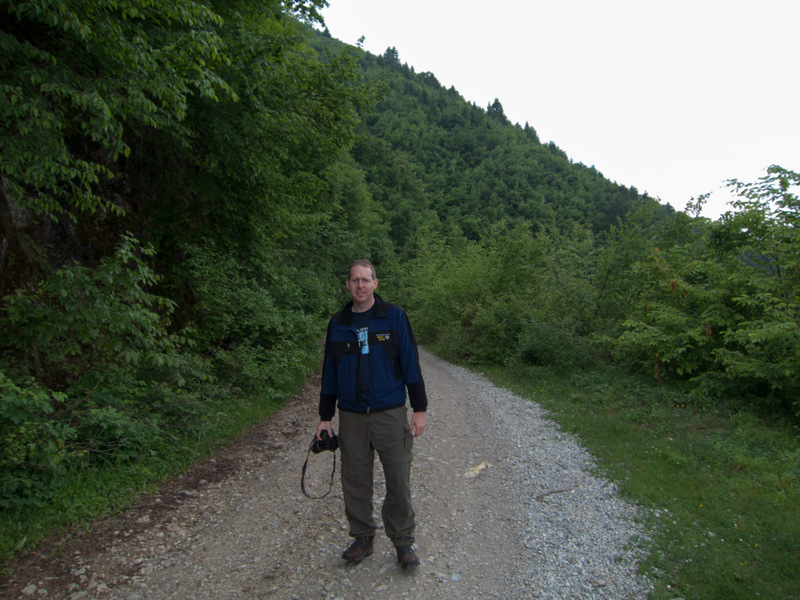 This is me trying to strike the same pose on a Mt Igman trail in 2012. Just not the same feeling at all. One thing I did not see on Mt Igman in 1995 was any of the old Olympic skiiing sites. We had a chance to see some of those this time and it was just a treat. Even though we were too late in the day to get up close, I just stood there and looked over the old ski jump site in awe. This is a much better sight than the things I saw in 1995. The most vivid of those memories is this mosque that was blown up. Notice the little kid standing by the road as we passed. I have always wondered if this kid made it through OK and is alive today. He must have wished he could have hopped in our Land Rover. We drove through so quickly I barely got a glance at him because I was looking at the mosque. I've stared at him in this picture many times since hoping he is OK. Sad. I wish we could have seen this place in 2012, but we could not find it. I hope you have found this post interesting. It has been inside my head for many years. Only this year was I able to see what this place looks like now. There are many other memories both past and present that are not in this post, of course. 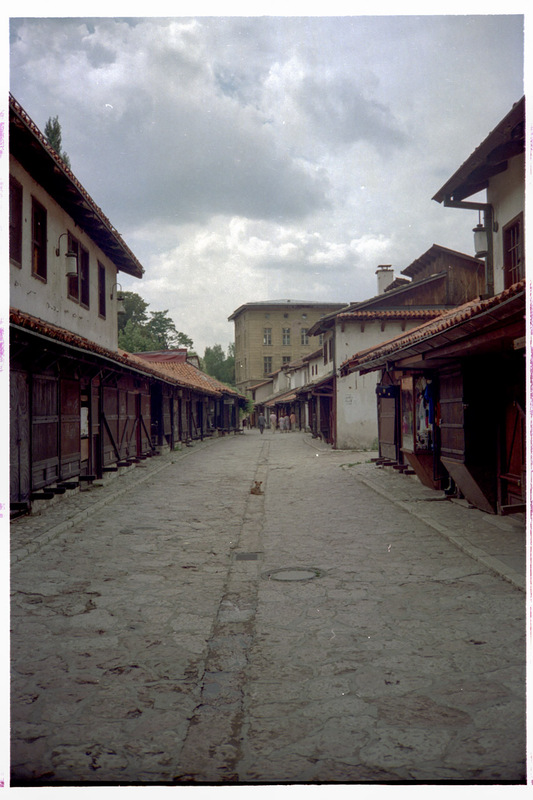 In a way, it has been like therapy to both re-visit Sarajevo and write down my thoughts after so many years. Thank you for reading. Free Trip to Europe!? Wish me luck! NomadicMatt is sending someone to Europe for 12 days. The winner will go to Budapest, Prague, and Vienna. I've been trying to get to these three cities for the past two years. Owing to a conspiracy between my wife and job, I've yet to make it! Help me, Matt! Last year I had a conference in Vienna. The family toured around Vienna for a week while I spent way too much time in a conference. My wife still tells me I have never really been to Vienna. We did spend a week in beautiful Halstatt which I highly recommend for a relaxing trip. This year was a trip to Eastern Europe. You would think. Nope. My wife wanted to go to a magical place I'd been years ago. So, we went to the Former Yugoslavia with a few days in Romania. It was a great time though. 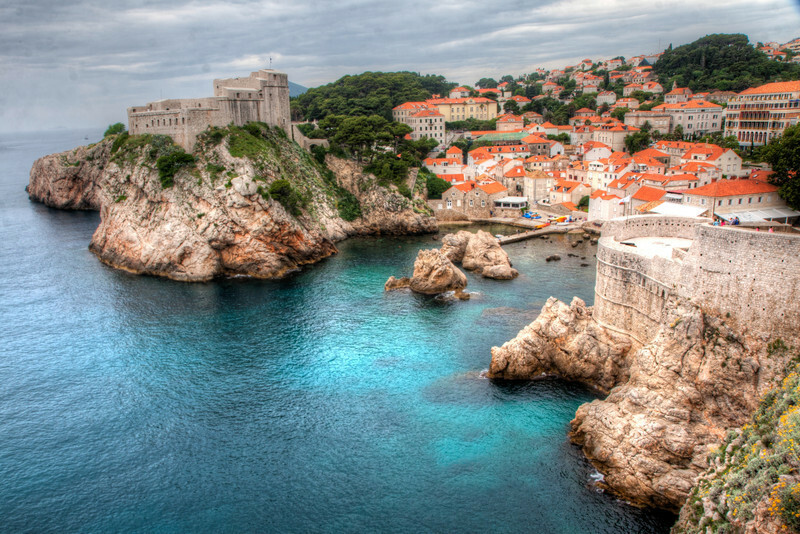 The Croatian coast is beautiful. OK, so maybe this is not that sad after all. These cities have been very elusive though! Once Matt helps me foil the evil forces against me, I have a plan. Live the Bohemian life for twelve days by starting in Prague, the capital of Bohemia proper. Vyšehrad Castle where Prague started. Explore Brno on the way to Vienna. Go to a thermal bath! They say a plan is only good until the battle starts. 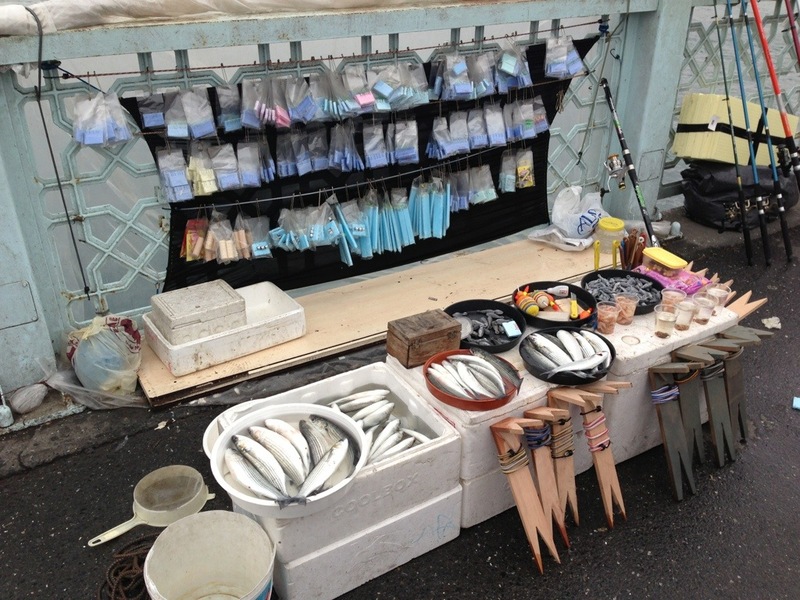 So, you need to think about what to do in case of a contingency. Got that covered too. Matt, please help me get this trip. I'd love to share the memories and photos with those who cannot make it. Third time is a charm and this is my third attempt to get to this part of Europe. Also, I am not sure I can stomach twelve days of William Shatner doing Bohemian Rhapsody! Help! Mürren is one of the most peaceful places we visited in Switzerland. There are so many great things to do in the area it is hard to pick. Here's a list of things we did on our trip and loved each one. Walk down to Gimmelwald - About mid-way through Mürren there is a path going down to Gimmelwald. It winds slowly down the mountain past a couple houses, a stream, a cow pasture, and finally into the village. The village is very relaxing and quiet. There is a neat playground near the cable car station if you have kids. They will love the long slide there. Follow 007 James Bond to Schilthorn - This peak is almost 9800 ft high and a great place to see Eiger and Jungfraujoch if the weather is good. The James Bond movie "On Her Majesty's Secret Service" was filmed here in 1968. There is a small museum there that shows a documentary of the film and several displays of production photos. 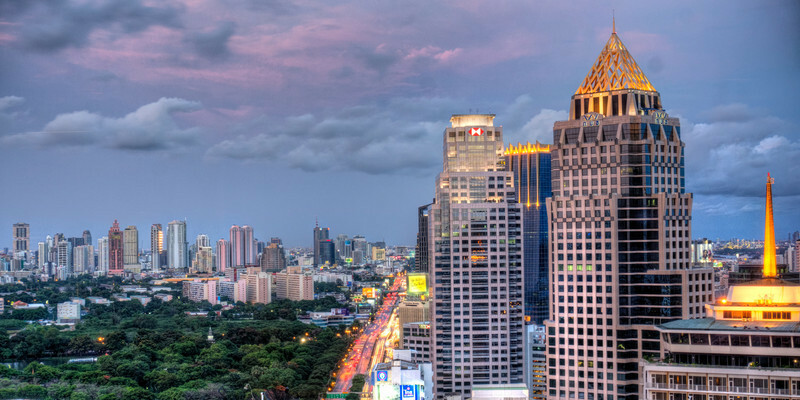 You can sit in the revolving restaurant and get a 360 degree view of the area. See waterfalls inside a mountain - Trümmelbach waterfalls is a great place to go especially if it is raining. You'll be inside the mountain anyway! 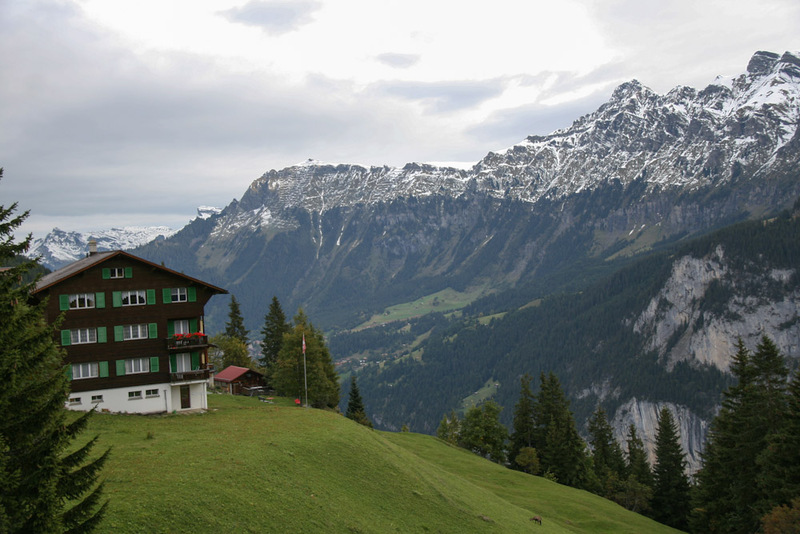 Take the cable car down from Gimmelwald, walk to the bus station, and take the bus. Very easy. Just ask anyone for help with which direction or which stop. 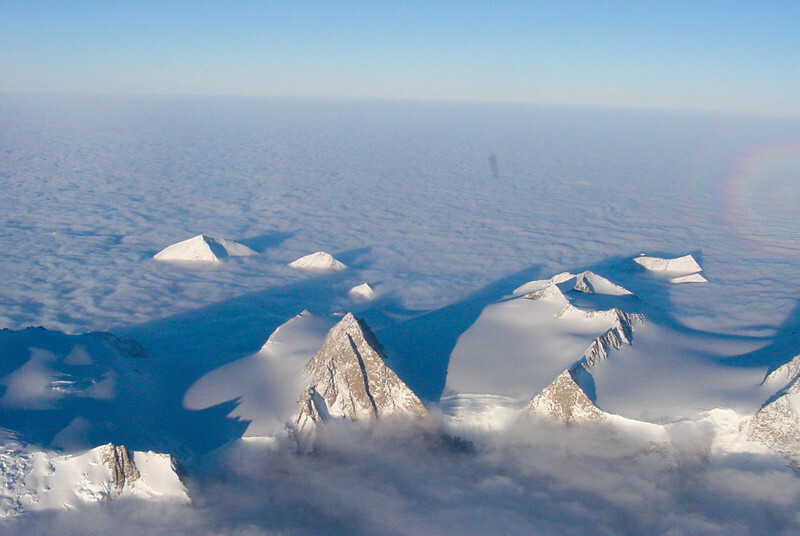 Visit the Top of Europe - Jungfrauyoch is really a must see. Just the train ride there is an experience in itself. Once you get to the top the views are obviously incredible. There is also an ice palace to tour. Be sure to leave time to walk around the village of Wengen on the way back down. It is a beautiful little place to spend an hour. Allmendhubel - This is a small summit above Mürren and you can get there via a small funicular train. Great place to walk around and a good starting point for some longer hikes. 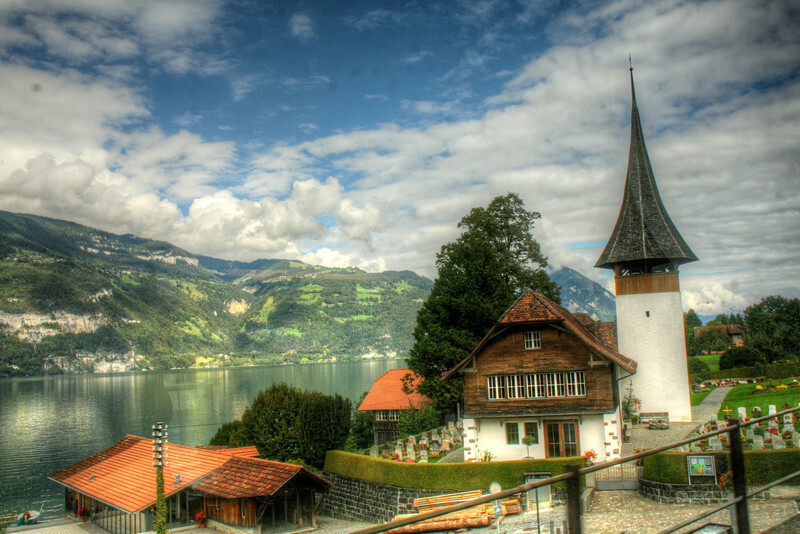 Obviously, there are plenty of things to do in Interlaken and you have to go through Interlaken to get to Mürren. 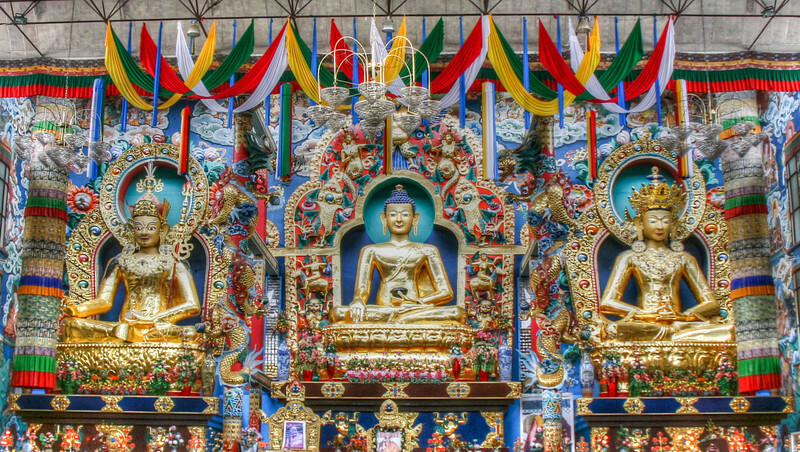 I purposely left that out of this post because there is so much to enjoy and experience. 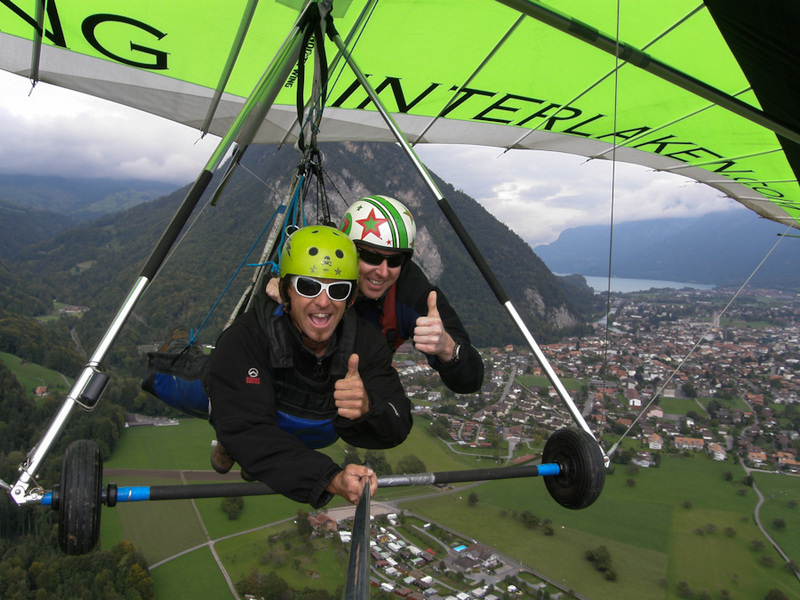 I would be remiss though if I did not mention Hang Gliding Interlaken. This was one of the most memorable experiences of my life. Ed was my pilot and really knows what he is doing. I will say the fool answered his mobile phone while we were up in the air. Scared me at the time, but really makes a fun story to tell now. Good on ya, mate! If you want to fly like a bird, please do contact them.